courtesy Vermont Creamery. Cream is easily whipped into a delicious topping or filling. With a bit more effort at the dairy, it can be turned into enriched creams, including clotted cream, crème fraîche, mascarpone and sour cream. Each has its own distinct character, each is a gift to people who love a bit of richness. Cream can also be thickened by fermenting with Lactobacillus bacteria, which is how three of our four featured, enhanced creams are made. Clotted cream/Devon cream, which relies on boiling and resting time to thicken (double cream is similar to clotted cream but with a higher fat content). Crème fraîche, cream cultured/thickened with Lactobacillus bacteria, a lighter, thinner alternative to sour cream†. Mascarpone, the Italian version of crème fraîche, but thicker and sweeter, soured by a lactic culture or an acid like vinegar or cream of tartar. Sour cream, cream that gets its sharp, tart edge by adding Lactobacillus culture. The cultured creams all have a delightful, piquant edge. We like them even better than the simple, often-too-sweet whipped cream, to garnish chocolate cakes and other sweet, rich desserts. *Historically, dairy farmers skimmed the cream from shallow pans of milk, let it sit again, and did this repeatedly to get the richest cream. Modern dairies use massive centrifuges to perform the same task in seconds (and produce creams with a consistent percentage of milk fat). †Note that depending on the producer, crème fraîche can be thicker than sour cream, or vice versa. Heavy whipping cream is warmed gently to a near boil, so the fat globules float to the top and form a firm layer. It is then left to cool for a day. This is the famed clotted cream of Devon and Somerset, England: a very rich, thick delight of about 60% milk fat, with flavors both creamy and buttery. Clotted cream is popularly enjoyed with fruit preserves on scones, on other baked goods, or as a topping for fresh fruit. Developed in France, crème fraîche (pronounced crehm fresh) is an often-thinner form of sour cream, with a more delicate texture and tartness. Cream is gently heated and then inoculated with bacterial cultures. The bacteria consume the cream’s natural sugars, producing lactic acid in exchange. This gentle acidity thickens the cream and imparts a mild, refreshing tang (less tang than sour cream because the amounts of the bacterial cultures used are far fewer). Crème fraîche is used as a topping, in sauces and other recipes. Aside from the celestial taste, the best thing about crème fraîche is that it can be heated and used in sauces without curdling. And, you can make it at home. 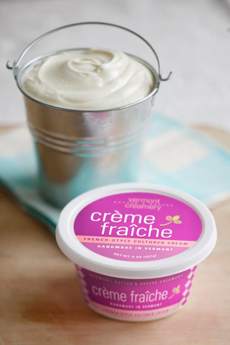 Here’s a crème fraîche recipe; a quicker alternative is to blend equal amounts of heavy whipping cream and sour cream. Mascarpone takes a third approach to thickening cream. The result is the richest, sweetest and most luscious; and spoonable, spreadable mascarpone is actually classified as a fresh cheese (a triple-crème). The cream is brought to a simmer until approximately a third of its original volume has evaporated. Then, an acid ingredient such as vinegar or cream of tartar is mixed into the warm, extra-rich cream. The acidity causes the cream to congeal to a thick, almost stiff texture, while retaining its mild and creamy flavor. It is the thickest and richest enriched cream, at 70%-75% milk fat. 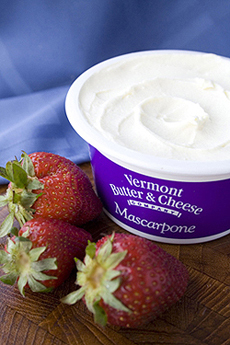 Mascarpone is intensely rich and used for desserts (cannoli filling, tiramisu, cheesecake, with fresh fruit) as well as in savory recipes (dips, sauces, spreads). It is often called “Italian cream cheese,” but the two products are technically different. Mmm, mmm, mascarpone! Photo by Claire Freierman | THE NIBBLE. To make sour cream, cream is fermented by lactic acid bacteria, which sours and thickens the cream. The production of lactic acid by bacterial fermentation is called souring. The taste of sour cream is only mildly sour—tangy would be a better word. Sour cream is used in recipes and as a garnish. When Little Miss Muffet ate her curds and whey, she was enjoying cottage cheese. We’d have topped it off with sour cream, which is how we enjoyed cottage cheese before we made the diet switch to nonfat yogurt. Yogurt is milk—not cream—that is fermented with Lactobicillus bacteria. It can be used as sour cream is used, to cut back on cholesterol (fat) and calories. Some material in this article was adapted from GlobalPost.com.